Lewis Morgan ended a whirlwind season with an appetite for international football after winning Scotland caps against Peru and Mexico. The 21-year-old attacker signed a four-and-a-half year deal with Celtic from St Mirren in January and was then immediately loaned back to help the Buddies get promoted the Ladbrokes Premiership while collecting the PFA Scotland Championship player of the year award to boot. To conclude a memorable campaign he was called up by Scotland boss Alex McLeish for the post-season challenge matches in the Americas against two sides going to the World Cup in Russia. 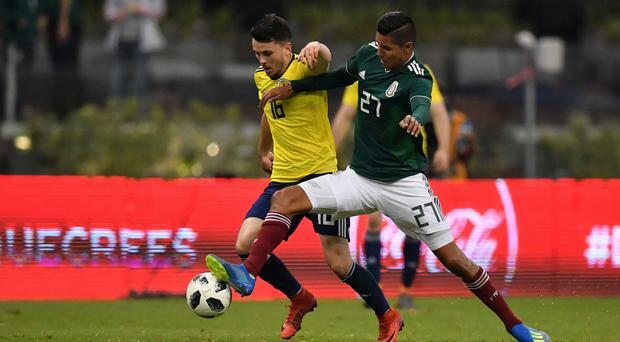 Morgan came off the bench to replace Matt Phillips in the 2-0 defeat by Peru in Lima last Tuesday before making another second-half substitute appearance, this time for Oli McBurnie, in the 1-0 defeat by Mexico at the Azteca stadium on Saturday night. Although his game time was limited, Morgan said how keen he is to stay in McLeish's plans. "Of course, I got the first taste of it in Peru and I would love to have had more minutes on the park against Mexico because I am hungry for it. "I can only thank the manager for giving me the opportunity to go out and play. "From the start of the season in the Betfred Cup, to end it at an arena like the Azteca stadium has been incredible for me. "I always knew that if I reached the targets I set myself I could get here and obviously I owe a lot to the manager for calling me up."